I’m sure you’ll agree that a good-quality cat flea treatment should safely and effectively protect your feline friend without a lot of hassle. That was our top criteria for selecting the best cat flea treatment. If you want to cut to the chase, the Advantage II Flea Control Treatment for Cats scored high marks in all of these categories and is our top pick for pet owners looking for an excellent product to control fleas on their cat. These are the best cat flea treatments and are customer favorites for their performance, availability, convenience and many other reasons. Dealing with fleas can be a real challenge, and if your cat is an outdoor cat, trying to cover all the areas he or she might wander to can be an impossible task. With these top-rated products, your cat can continue doing what cats do, but they will be protected from annoying pests, especially if you take care of the fleas before they become a problem. Riding your cat of fleas can be done in several different ways and some products are meant to be used in conjunction with others. With the information we have provided for you, you will be able to choose which cat flea treatment is the best for your cat’s needs. 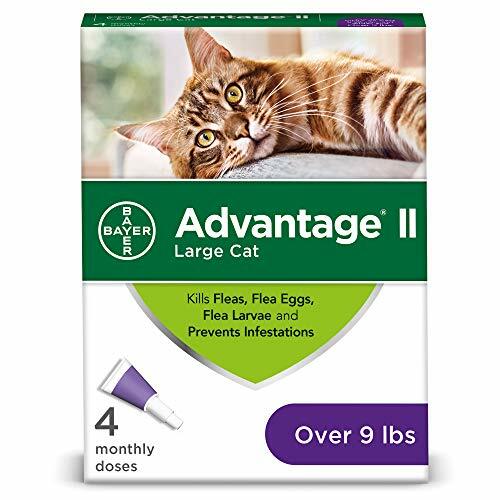 Advantage II is a great product that will help you get rid of the fleas on your cat month after month. This product takes care of the fleas, the flea eggs and the larvae. When you kill adult fleas, you will no longer have eggs being laid, so this takes care of any re-infestation problems. Treating fleas on your cat prevents additional problems from occurring such as flea-allergy dermatitis which can affect both cats and dogs. When you use Advantage II cat flea treatment, the fleas that are biting your cat will be stopped within about 5-10 minutes. In addition, within 20 minutes, 99% of flea larvae will be dead, 98% of all fleas will be dead in up to 12 hours, and chewing lice will be gone in a week. All you need to do to protect your cat from fleas is to apply this topical treatment once a month, behind the head and at the base of the neck where the cat won’t be able to reach it to lick it off. It is safe to use on cats and kittens that are 8 weeks old or older. This package contains a 6 month supply or you can use the doses for multiple cats (1 tube per cat). Even if your cat gets wet, Advantage II will remain effective at protecting your cats from fleas and chewing lice. 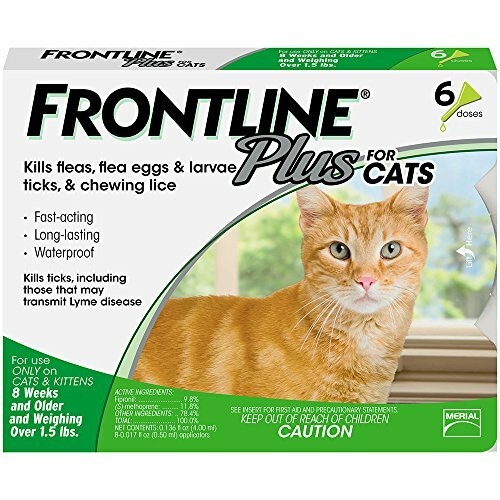 Frontline Plus for cats and kittens is a well-known product that most people have heard of even if they don’t use it on their own pets. This product will allow pet owners to take care of fleas, flea eggs, lice, and ticks too. It can be used on cats and kittens 8 weeks and up and should not be used on any kittens younger than 8 weeks. The application process is very simple and just involves placing drops behind the head, at the base of the neck of the cat. You may want to have an extra pair of hands around to hold the cat while you apply the topical treatment since some cats don’t enjoy being messed with in this manner. This is the perfect spot because cats can’t get to the back of their own necks and that means no danger of the cat licking the topical treatment off. It is best to keep cats separated from each other for a couple of hours while the treatment is drying. Frontline Plus includes a satisfaction guarantee for their customers so if you are not happy with the results, they will take care of you. This means they stand behind their product and know that it works. You can purchase this product in 3, 6 and 12-month dosages. (1 tube per cat) or if you have multiple cats and you get a 3 month supply, you can take care of 3 cats for one month. When you are dealing with fleas on your cat and in your home, you can’t just treat the cat OR the home, you have to treat both. 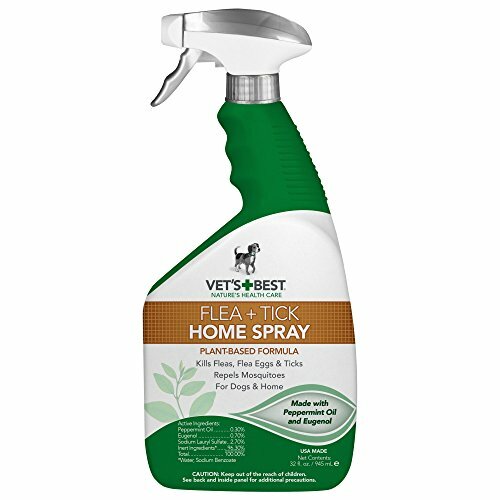 Vet’s Best Flea and Tick home spray works great on your cat’s bedding, scratching posts and anywhere else your cat hangs out. This terrific spray kills fleas, ticks, and even mosquitoes on the first contact. The peppermint oil and clove extract is all-natural. The scent can be strong when it is first sprayed but it is non-toxic and safe for pets and kids to be around. You can use it around cats and kittens 12 weeks or older but it should not be used around very young kittens less than 12 weeks. It has no Pyrethrins or Cedar Oil, both of which can be very toxic and dangerous to cats. When you’re working hard to get rid of the fleas, you want a product that is really going to make a difference in the flea population and this is it. After you bathe your cat and use one of the recommended cat flea treatments, use this customer favorite home spray all over your home; furniture, corners, carpeting, bedding, and more. Vacuum after it’s dry and dump the vacuum canister or bag outside in the trash can, and notice a big difference in the amount of fleas you see in your home. It is worth it to take the extra step and treat the cat’s surroundings as well as the cat itself so you really take care of the problem rather than just covering it up temporarily. You get 64 ounces in this bottle to tackle the flea problem in your own home. These top rated cat flea treatments are all customer favorites and best sellers. If you want to treat the fleas on your cat or kitten and in their areas as well, any of these products will do the job well. They have ingredients that are proven to work and that will prevent your cat from developing other issues that can be caused by fleas that are not treated. Below is a buyer’s guide with even more information on buying cat flea treatments. This information will help you understand what you need to know to make the best decision for your cat and its situation. Not every cat flea treatment is the same and not all of them work. The top-rated treatments here are bought by thousands and they work well. Once you understand what a cat flea treatment does and how it works, along with how the flea life cycle works, you will be way ahead when it comes to battling fleas. Fleas are one of cat owner’s biggest nuisances. Dealing with a bad case of fleas can feel like it takes every ounce of energy you have, especially if you don’t understand how to account for the flea life cycle when you are treating them. Since there are 4 stages to the flea life cycle you have to kill the adults but also the eggs, larvae and pupae as well or you’ve wasted time and product too. Cats are normally fairly calm animals unless they are playing. There are some signs that you can look for in addition to the obvious sightings of fleas on the cat or its surroundings. If you notice any of the following in your cat, you can probably assume you have fleas to get rid of. Biting when You pick it up or try to pet it – An irritable cat is one that will not want to be bothered. When they are suffering from fleas biting them, they are not going to be in the best of moods and this can result in them biting when you do pick them up or try to play with them. Using the bathroom other places than the cat box – cats oftentimes use the bathroom outside the cat box as a way to express that something is not good in their world. If this starts, one of the culprits could be unhappiness at dealing with a lot of fleas. Constant scratching or biting itself – a cat with fleas will do the same thing a dog with fleas will do…scratch. If you notice your cat scratching a lot, chances are they have fleas. Aggressive grooming, sometimes to where they start bleeding or get sores – if the fleas are plaguing your cat, you will notice them biting or chewing on themselves constantly. They may even create sores. It is important to take care of this right away since these sores can get infected. They stop wanting to eat – one of the first things to go when a cat has a major flea problem is eating. They simply don’t feel well enough to eat. They don’t want to play – Just like with a child that doesn’t feel well, if your cat is suffering from fleas, they will not feel much like playing or interacting. If you notice any of these behaviors, the first thing to check is their coat to see if you see fleas or eggs. (This is assuming that you haven’t seen any fleas up to this point.) If fleas are identified, there are many things you can do and purchase that will help you take care of the nuisances that are affecting your cat’s personality. Fleas are much more serious than people realize. They can cause many illnesses to occur that can be very serious for your cat. This is why we stress the importance of immediate treatment and also recommend treating the indoor areas where your cat sleeps, plays and hangs out. As long as you treat both the cat and its surroundings you won’t be fighting a losing battle. Feline Infectious Anemia – A serious and potentially life threatening disease that is contracted through bad flea infestations. Outdoor cats are more likely to get this illness although your indoor cats should not be overlooked. Symptoms of this illness include: Gradual or sudden weakness, their gums are pale, they may lose weight, they may act different or depressed, they will stop eating, their breathing may be very rapid or labored and others. If you notice any of these symptoms, get your cat to the vet for further care. Flea Allergy Dermatitis – Cats and dogs both can get this illness that is an allergic reaction to flea bites. You may notice hot spots, open sores, hair loss and constant itching when your cat has this condition. It needs to be treated by a veterinarian. Cat Scratch Fever – This is an actual disease that is carried by cats and can be given to humans through a scratch or bite. Cats will usually get it from being bitten by a flea that also bit a cat that had it. It can cause headaches, fatigue and fever in humans and should be checked out by your doctor. There are many different kinds of flea treatments available on the market today. So many that choosing the one that you will be happy with can feel overwhelming. We have listed all the different types of cat flea treatments that you have to choose from. When choosing the right one for you, be sure to take into consideration your cats needs and age as well. Topical Treatments – Monthly – Topical treatments are very popular due to the fact that they are typically easy to apply and they are very effective for not only killing fleas but killing eggs and ticks too. Application is as simple as putting the liquid on the base of the neck of the cat where they can’t lick it off. These treatments come in packs of 3, 6 and 12 and you use 1 tube per cat. They are also given according to weight so you will by the right pack that is for the size cat you have. If you’re treating a kitten, make sure that they are above the required age. Cat Flea Shampoo – Most people don’t like to give their cats a bath and the cat certainly doesn’t like it, but when your furry feline has a flea problem baths are great ways to get a jumpstart on getting rid of them. There are many different brands of flea shampoos on the market. They are not meant to be used alone to prevent fleas so you should have a preventative method to use after their bath. Again, like with the topical treatments make sure of the age requirements for flea shampoos and don’t use them on super young kittens. Cat Flea Spray – If you want something to use on your cat in between monthly topical treatments flea sprays are a great choice. They are designed to kill the fleas on contact so they can be very beneficial to use in between topical treatments or oral treatments. They will not keep new fleas from jumping onto your cat, so remember to have that preventative method chosen and use regularly. Cat Flea Powder – Flea powders are not a popular choice due to the fact that they are messy to use and can also dry out your cat’s coat or skin. Don’t plan on using flea powders long term and use them only if you don’t have anything else handy. Cat Flea Collars – Flea collars are easy to use, non-messy and when the right brand is purchased, they are effective. The top brand flea collars usually provide protection for up to 8 months unless the cat is wet a lot and then the effectiveness can decrease to 5 months. Be sure that the collar you purchase is specifically for a cat or kitten and that you get the right size according to the package instructions. Your cat can wear their regular cat collar in addition to their flea collar. If you are wondering where the fleas can hide in your home we have listed the common places that you will find these pests. When you treat your cat or kitten for fleas, be sure to treat these areas as well to make sure that the cat doesn’t get re-infested with fleas. When you are treating the home, be sure to treat all of these areas and anywhere else that you know your cat hangs out regularly. Treating these areas along with your cat will ensure thorough treatment and elimination. With the information that you have learned in this buyer’s guide you will have the knowledge you need to choose the right flea treatment program for your cat or kitten. Fleas don’t have to be a part of having a cat or kitten. If you stay on top of it, you can sail right through the flea season with minimal hassle and annoyance for your cat. The right knowledge will enable you to assess your needs and purchase the treatment that will be the most effective and the best for your pet. A cat without fleas will be a healthier, happier cat and that means you will be happier too. It may feel like it’s impossible to get rid of them, but if you stick with it and treat both the cat and the home, you will notice fewer and fewer fleas until you don’t see any around or on your pet.